The third annual UPS report on consumer shopping behavior, released this week, found that while more than half of consumers prefer online shopping, they aren't won over by the mobile shopping experience just yet. If you're building a mobile shopping app, take note: Almost half of the consumers surveyed said they will forego making a purchase on their mobile device and use a PC instead because the product image isn’t large or clear enough. 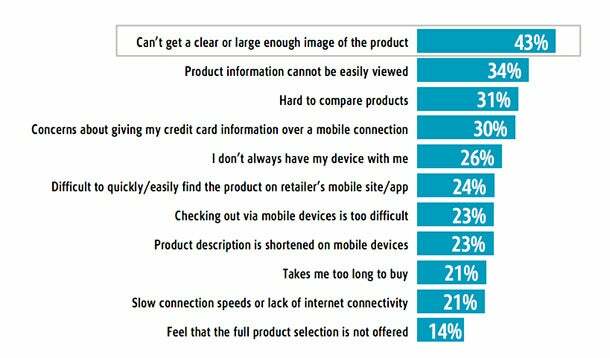 For the complete survey results on why ecommerce shoppers are still resistant to the m-commerce experience, check out the graph below.